By now we all know the touted benefits of shopping local. It’s a no-brainer for supporting and retaining our community, not to mention the unique products available and added distinction to our city. 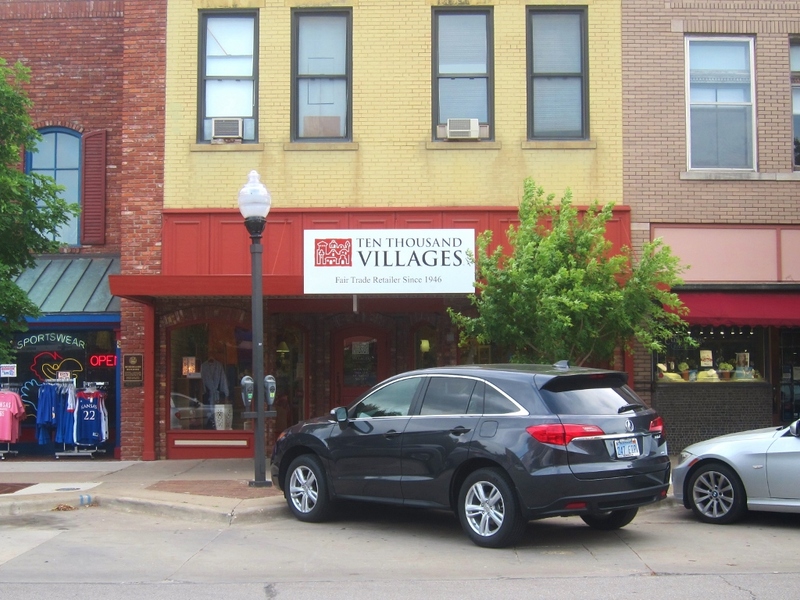 This exercise in socially responsible shopping can be made even greater when the local purchase not only enhances our home community, but also contributes to communities globally. 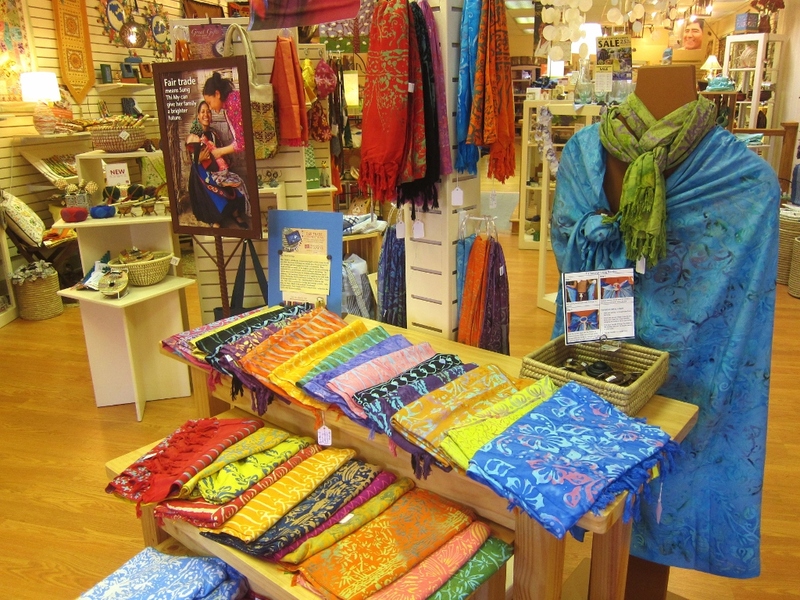 Ten Thousand Villages, one of the world’s oldest and largest fair trade organizations, makes that possible for us all. Large display windows are so inviting coupled with the coral trim. Product from around the world in unique colors and designs. 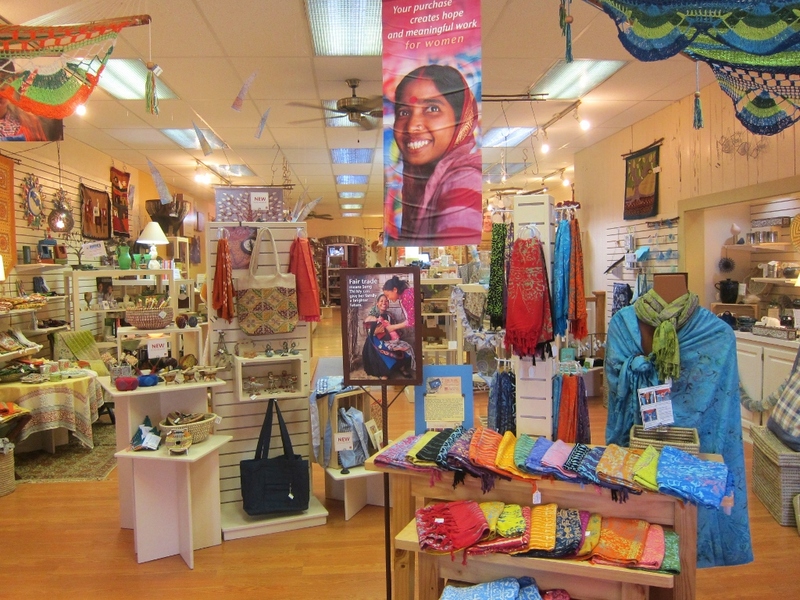 Ten Thousand Villages opened on Mass Street in October of 2012, and the store currently carries products from 38 developing countries. All products are handmade, environmentally sustainable, and fair trade (which means your purchase helps supports under- and unemployed artisans in other countries). With only two paid employees and 60 local volunteers, this nonprofit depends on generosity from our Lawrence community to fulfill its mission of developing long-term fair trading relationships. In this way, sales revenue generated by Ten Thousand Villages is used to increase purchases for new product. Blue Hand Sarongs from Indonesia. 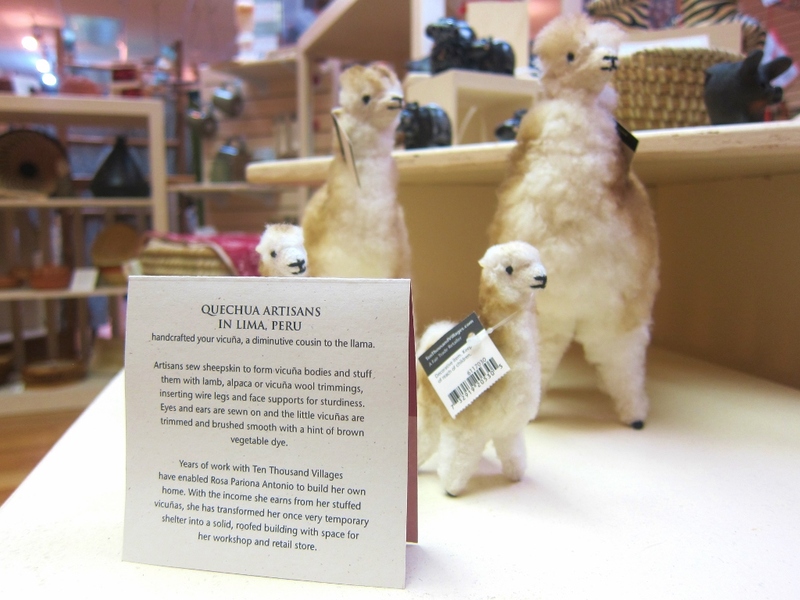 Vicuña (related to the llama), made in Peru. I stopped by the store last week to chat with Scott – the Lawrence store manager – and learned about some of the more popular items in the store. Scott showed me some vibrant bracelets made from Tagua nut (the dried seedpod of the Tagua Palm tree out of South America). The smooth texture of these beads is so similar to that of elephant or animal ivory, it makes for a sustainable and ethical alternative. 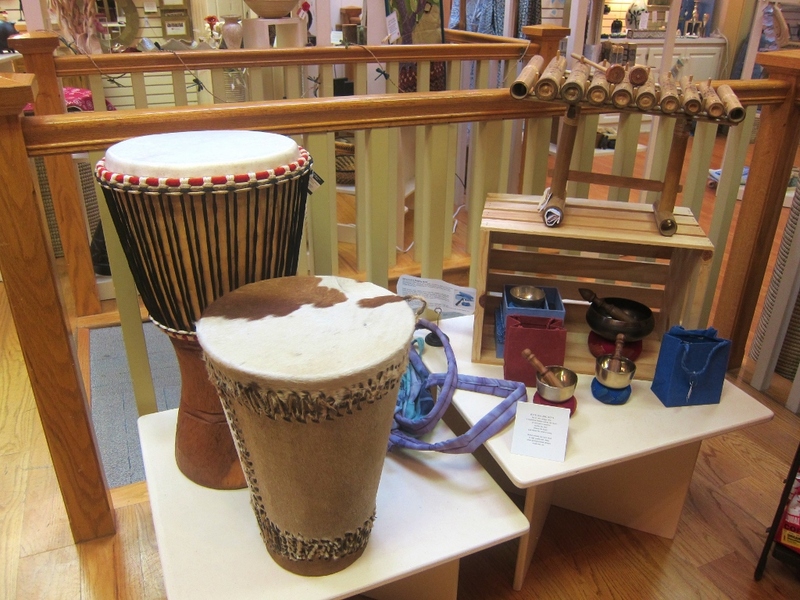 Shoppers also take fairly quick notice of the musical instruments in the store, particularly the drums. The Djembe Gathering Drum, for one, is a leather-covered hand drum made in West Africa. It’s so handsome and impossible to resist! I had to tap my fingers on it, just to get a feel for its musical possibilities. The musical instruments here are so enticing. 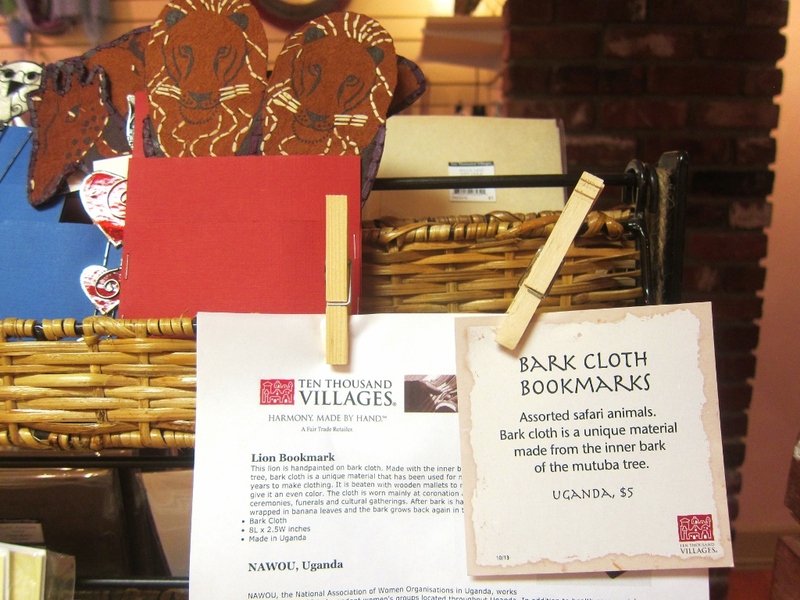 Wild Bark Cloth Bookmarks from Uganda, $5. Overall, this shop is not short on exquisite products. 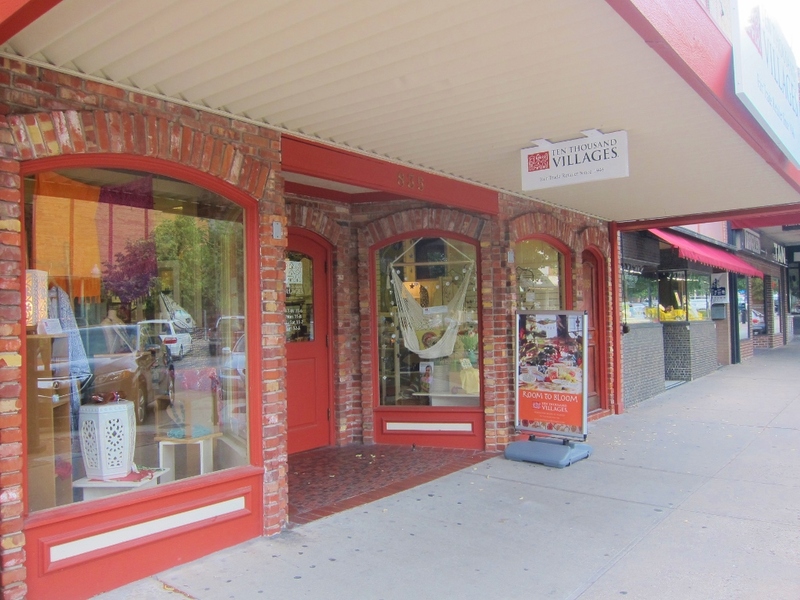 You will find everything from jewelry to home accents, and kitchen and dining to patio and outdoor items. Ten Thousand Villages here in Lawrence also hosts an event about once a month. These events often include festive music and food, so make sure to connect with them on Facebook to stay up-to-date. Interested in supporting our local store? If you have at least eight hours a month to volunteer, and an interest in supporting fair trade, Scott would love to hear from you. This entry was posted on Sunday, June 29th, 2014 at 5:00 pm. It is filed under Businesses and tagged with art, fair trade, gifts, shopping. You can follow any responses to this entry through the RSS 2.0 feed.